Being an electronic students, we know many components and their usage. 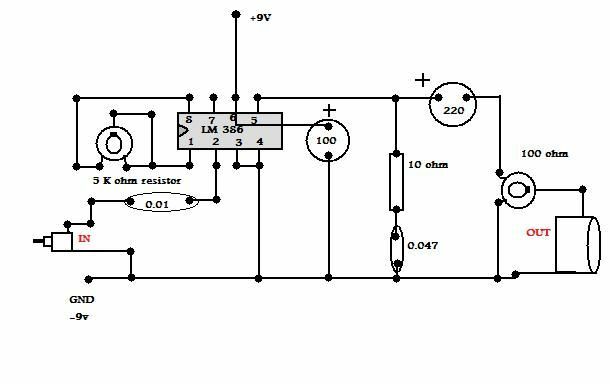 Having real time exposure will help you to gain in depth knowledge about the component and how it works in the real scenario.. One can easily build small circuits using many electronic components in their leisure time .Here is an example on how to design a simple audio amplifier. Now draw a circuit diagram which indicates where to place the components on the bread board. First place the LM 386 IC and take a wire and join the 3rd pin to 4th pin(GND pin). 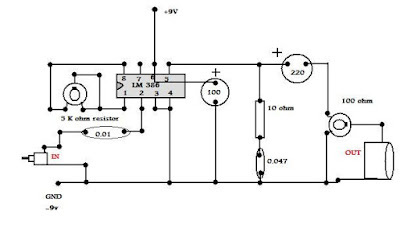 Join the one pin of 0.01 capacitor with the 2nd pin of IC. The other pin of the capacitor should be joined with the input. Now join the 1st pin of IC with the A pin of the 5 k ohm variable resistor. Join th A pin of this variable resistor with the C pin.Lastly join the 8th pin of IC with the B of this variable resistor.This becomes the Gain. Join the +ve side of the 100 micro Farad capacitor with 6th pin of the IC.The -ve of this capacitor should be joined with GND pin (4th pin of IC). Join the 5th pin of IC with one side of 10 ohm resistor, the other side of the resistor should be joined with the one pin of 0.047 capacitor. The second pin of the capacitor should be joined with the GND pin (4th pin of IC). Join the +ve pin of the 3.5mm stereo jack female with the C of the 100 ohm variable resistor.And the GND of the female jack should be attached with the GND of the IC (4th pin of IC). Now again join the 5th pin of the IC with the +ve side of 220 micro farad, the -ve side of the pin should be attached with the A of the 100 ohm variable resistor.The B pin of the variable resistor should be connected to the GND pin (4th pin of IC).This becomes the Volume controller. Join the +ve of the 3.5 mm stereo jack male with the other side of the 0.01 capacitor and join the GND of the male jack with the GND of the IC. Last but not the least join the +Ve of 9V battery with the 6th pin of IC and -Ve of the battery with the 4th pin of IC. Join the male jack with your mp3 player or musical instrument and female with the speakers.Now adjust the Volume and Gain to get the best and loudest possible sound.I should notify you that with this amplifier only one speaker will work.And do the adjustment from low to high.Do the adjustment carefully or it can damage your speakers. You can change the input jacks as your requirement.You can add a 220 micro farad variable capacitor instead of simple 220 micro farad capacitor to change the bass.